BOTTOM LINE: DEX! A Killer Musical has some fun moments, but this musical parody perhaps hews too close to its source material. Pop-culture parodies are a Fringe staple. Done well, they can provide incisive commentary on any number of hot button issues, or shed new light on a seemingly familiar subject, or even just offer an enjoyable evening of laughs. Trouble is, while it’s easy enough to think up any number of potential targets for parody, the successful execution is another matter entirely. The talented and energetic ensemble of DEX! A Killer Musical certainly does their best, but the show itself would benefit from some retooling. The set-up is fairly straightforward: after reading the script for the series finale of the TV series Dexter, Michael C. Hall (who played the show’s title character, a serial killer with “a code”) is unhappy. And because they’re afraid Hall’s method acting might…get bloody, Dexter’s executives agree to perform all eight seasons of the show so that Hall can make a case for a different ending that is more to his liking. This sounds like a terrific premise, sort of The Complete Works of William Shakespeare (Abridged) with serial killers. But unlike that show, which (for example) performs all of Shakespeare’s histories as a football game, the writers of DEX! A Killer Musical take the time to go through every season and all of the key plot points; the labored result is a sort of musicalized Wikipedia entry that may only appeal to the most hard-core fans of the series. And for such fans, all your favorite characters are here. There’s Dexter’s sister Deb (a wonderfully manic Macy Idzakovich), his all-too-understanding girlfriend Rita (the lovable Emmanuelle Zeesman), the suspicious Doakes (a lively Erick Carter, who begrudgingly plays all the “dark” roles), Detective Quinn (Andrew Baldwin, who does handsome-but-clueless quite well), Lieutenant LaGuerta (the vivacious Gabriela Hernandez), and Lumen Pierce (a deceptively sweet Allyson Webb). And of course we can’t forget the show’s key serial killers: Dexter’s long-lost brother Brian Moser (a hilarious Jackson Mercado), the Trinity Killer (the highly enjoyable Jason Damien), Jordan Chase (Baldwin again), and Travis Marshall (the extremely talented Peyton Thomas, who, in a fun moment of inspiration, also operates the puppet playing his mentor Professor Geller). And then there is Dexter himself, played by the outstanding Bradley Lassiter in the best performance of the night. Over the show’s two hours, Lassiter, whose fantastic singing is matched by his intense acting, almost never leaves the stage and never lets up; without him, DEX! A Killer Musical would be a significantly lesser piece. Yet as wonderful as this ensemble is, they can only do so much with this material. True, some of Joe Schermann’s songs are quite enjoyable, especially the opening number and an early song between Dex and his brother Brian. And while I was less impressed with his parody of “Fugue for Tinhorns,” I actually wish there had been more music, especially in the second act. Erika Jenko’s book certainly does a great job at taking us through all eight seasons of the television show; even if you’ve never seen Dexter, you’ll have no trouble following along. But the musical needs a more cohesive vision. Sure, there are a few fun sight gags, the occasional projection, and some clever replacements for blood (although some real stage blood would have been welcome). But the best moments all feel a bit random, as if the team threw in whatever ideas would get a laugh. 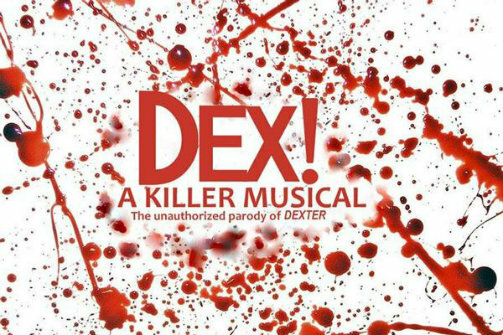 There’s a great show somewhere in DEX! A Killer Musical; if the writers can be as ruthless as their hero, they may find it.